Firefighter Christopher Howard, 31, of Engine 255 in Brooklyn with the recipient of his bone marrow, John Ciempa, 66, on Wednesday in New York City. How do you thank the man who saved your life when you meet him for the first time? With a bear hug in front of a roaring crowd. 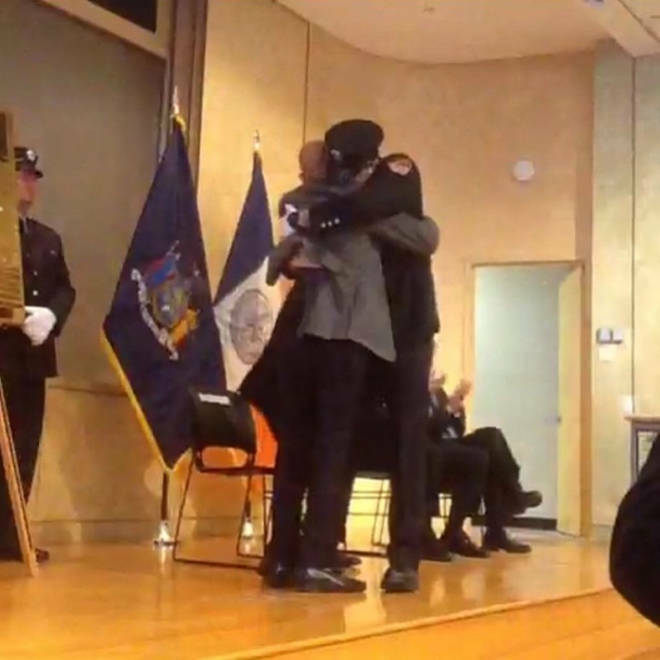 At a ceremony in Brooklyn, N.Y. on Wednesday, John Ciempa, 66, wrapped New York City firefighter Chris Howard in an emotional embrace as a room packed with firefighters and cancer survivors cheered. 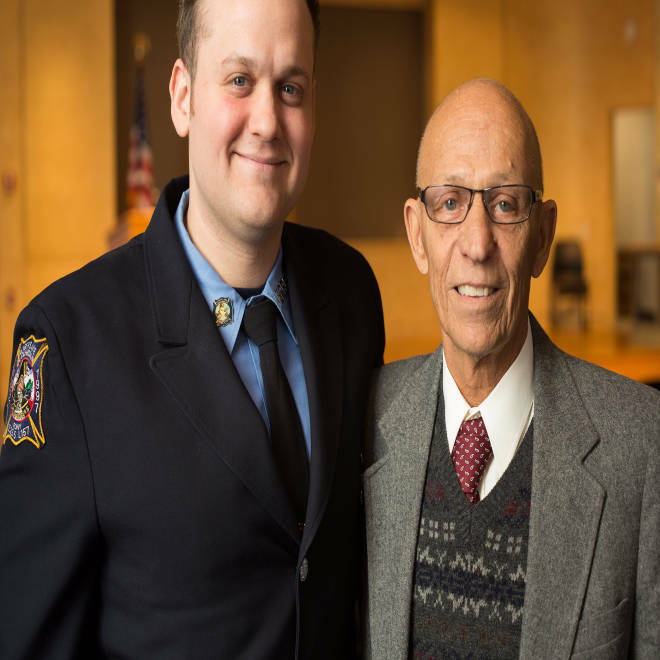 Ciempa, who’d been given six months to live before receiving a bone marrow transplant from Howard, is one of the many cancer patients who’ve benefited from the New York City Fire Department’s remarkable commitment to providing donors. More than 8,000 FDNY personnel have signed up for the New York bone marrow registry, and they account for 10 percent of all state donors. For Howard, 31, the motive for donating was the same reason he became a firefighter in 2005 -- helping people -- but the fact that the recipient is the father of twins made the donation especially meaningful. “It definitely means a lot more to me because I don’t have my dad anymore, so it’s that much more special that they get to keep theirs,” said Howard. Howard is the son of a 9/11 hero. 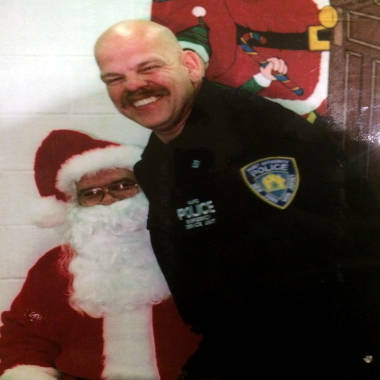 George Howard, a Port Authority police officer, responded to the call for help from the World Trade Center on his day off and died in the collapse of the second tower. George Bush carried his police badge in his pocket throughout his presidency. George Howard, a member of the Port Authority Police Department emergency services unit, died in the Sept. 11, 2001, terrorist attacks on New York City. He had responded to a distress call from the World Trade Center on his day off. His mother presented President George Bush with his badge, and Bush carried the badge with him throughout his presidency. In 2010, Ciempa, a New Hampshire contractor, had just retired and moved to Lakeland, Fla., when he was diagnosed with myelodysplastic syndrome. The condition often leads to leukemia, and doctors told Ciempa he needed a bone marrow transfusion. By then, Howard had already been a firefighter for nearly five years. Like many FDNY firefighters, he had signed up for the bone marrow registry when he was a “probie,” meaning a new, probationary firefighter straight out of the academy. The FDNY doesn’t require its employees to register as donors, but more than half of the department’s 14,000-plus uniformed and civilian employees have done so. Seven years after registering, in 2012, when he’d forgotten about signing up, Howard heard that there was a match. “I never thought it was going to happen,” said Howard. Doctors extracted marrow from his back. According to Howard, the procedure wasn’t as painful as some have made it out to be. “I got my elbow tattooed a couple of weeks ago and that hurt a lot more,” he said. John Ciempa, 66, hugged firefighter Christopher Howard after meeting him for the first time at a ceremony in Brooklyn, N.Y. on Jan. 29, 2014. Ciempa received a bone marrow transplant from Howard in 2012. In Florida, Ciempa had already endured chemotherapy and one aborted attempt to transplant marrow, and had been given just months to live, when he heard that there was another bone marrow match from an unidentified donor in New York. On May 8, 2012, doctors transplanted Howard’s marrow into his body. For months, Ciempa remained in the hospital, battling one illness after another. His weight plummeted to 118 pounds. But then doctors told Ciempa he was in remission, and in August he went home. He wanted to thank the donor who had saved his life, but under the rules of the program, he had to wait a full year. The doctors don’t want the donors to interact with patients who haven’t been as fortunate as Ciempa. It wasn’t until 2013 that the men were allowed to exchange emails, and Ciempa learned that the man who saved his life was the son of a police officer who’d died trying to save lives. “I felt sad that a man who had lost his father had just given me life when he could not give his own father life,” said Ciempa. And it wasn’t until Wednesday that the men were able to meet in the flesh, at a ceremony at FDNY headquarters in downtown Brooklyn, staged by the New York Blood Center to honor 13 different FDNY employees, including Howard, who have donated bone marrow by adding their names to the Blood Center’s “Honor Roll of Life.” To date 162 firefighters and other FDNY employees have donated bone marrow to patients – some more than once. As a sign of his gratitude, Ciempa gave Howard a guardian angel bracelet blessed by his priest.